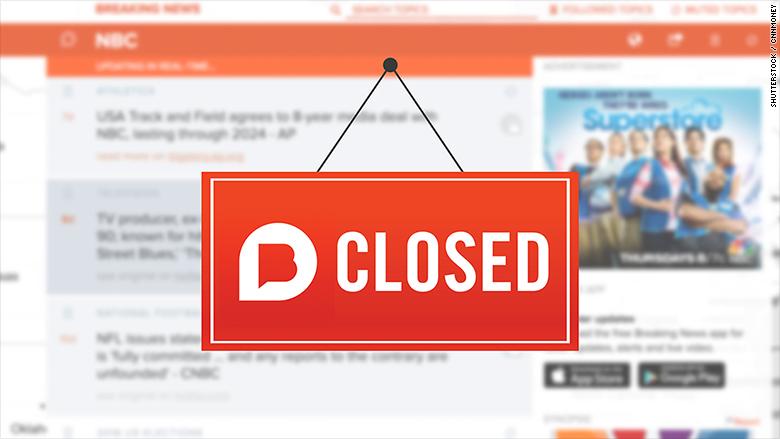 NBC News has decided to shut down the Breaking News alert service due to its failure to generate adequate revenue, the company announced Thursday. "Unfortunately, despite its consumer appeal, Breaking News has not been able to generate enough revenue to sustain itself," Nick Ascheim, the head of the NBC News Digital Network, wrote in a memo to staff. Breaking News, which NBC has owned and operated for five years, included a website, mobile app and Twitter feed that delivered news alerts from sources across the internet. Over time, it became a valuable tool for journalists, Wall Street traders and news addicts. "We're true believers of news that isn't designed for clicks, but a service that helps people and companies make smarter, safer decisions," Cory Bergman, the site's general manager, said while announcing the news on Twitter. "As we discovered, such a model doesn't fit with advertising, and despite a surge of interest in our premium data, the money has run out." Breaking News will close at the end of the month. Bergman and his team "will remain with the company until late January," Ascheim said, while the company tries to find new roles for them at NBCUniversal.